• ⅔ cup finely chopped scallions,  1 or 2 tablespoons reserved for garnish. • 30 (about 4 pounds) disjointed chicken wings , the wing tips cut off and reserved for stock. cinnamon, the jalapeño, the black pepper, the Habanero sauce, the soy sauce, and the oil. Add the vinegar,  cider and shake well. wings marinate, chilled, turning  them once, for at least 3 hours or, preferably, overnight. sides About 10 − 15 minutes. but not dried or burnt to the bottom of the pan. Remove the wings and cool enough to handle. 5. 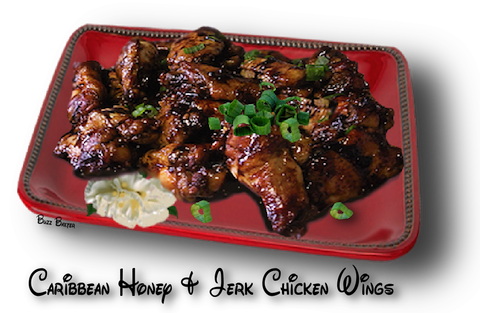 Place the wings on a serving platter and garnish with reserved scallions. Serve with lots of napkins.